This article was last updated on the May 17, 2018. The Font Manager is one of the easiest ways to manage your fonts with no hassle and instant updating site wide! Going back and changing 20+ font options is a thing of the past. Once a font family has been selected, the "Font Weights" dropdown will update it's values to display what weights are available for that font family. The beauty of the Font Manager is if you ever want to go back and make adjustments to your site's fonts, you can update it in one spot in the Font Manager and it will be automatically reflected across your entire website! This is an incredibly powerful tool that should certainly be taken advantage of for large builds, and even smaller sites alike. 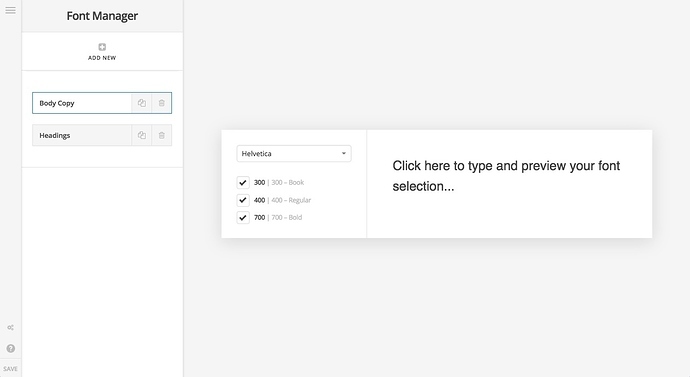 Imagine if you had a long landing page full of Elements. It's easy to imagine that you might be calling up the same fonts over and over again across your design...probably hundreds of times. One thing to keep in mind is that hosted fonts from a service like Google Fonts or Typekit add weight to your site, so make sure to keep your selections minimal when utilizing those rather than system fonts like Georgia, Helvetica, et cetera. 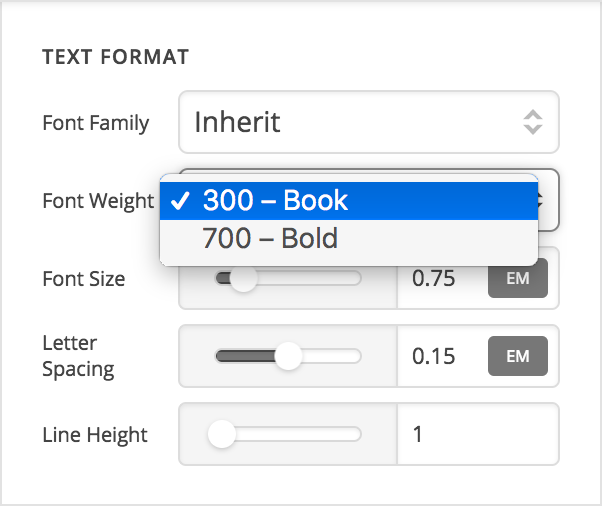 Once you've entered your Adobe TypeKit ID you'll see a list of available fonts which will then be selectable from the dropdown in the Font Manager. 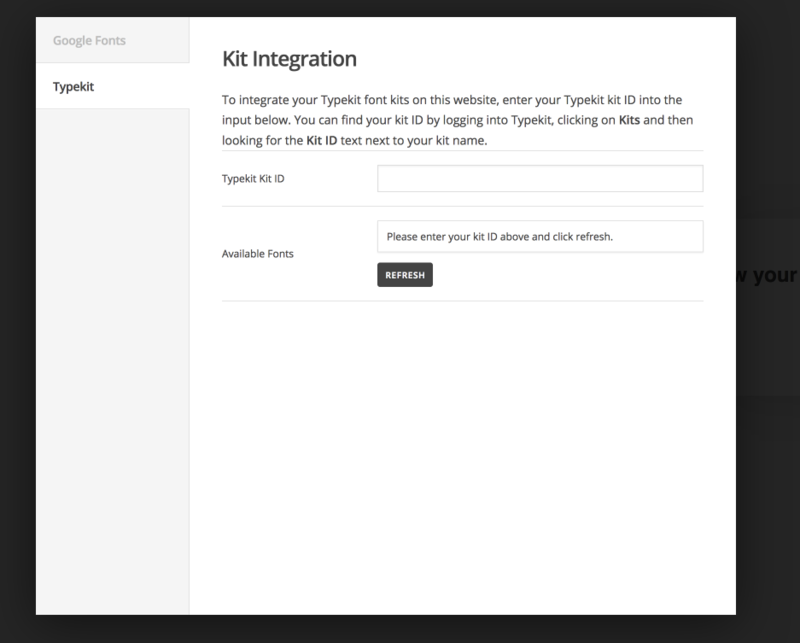 To get your Adobe TypeKit ID follow our other article here you don't need to install our Adobe TypeKit extension just follow the article from the Getting your TypeKit ID section. 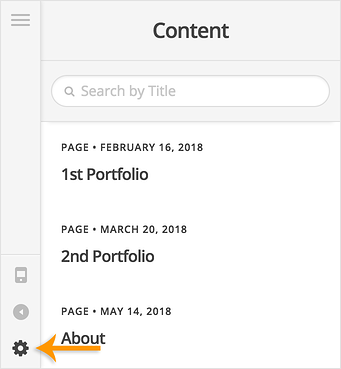 Once you've finished editing your fonts click on save in the bottom left and your fonts will be updated throughout the site. This is useful if you want to change a specific font all at once. 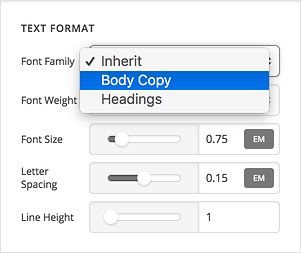 For example, if you use a specific font for h1s, you can add a font and then in the theme options set that to be used for your h1s, then if you want to switch to a new font, just come into the font manager. Change the font used click save and it'll be updated everywhere on your site. 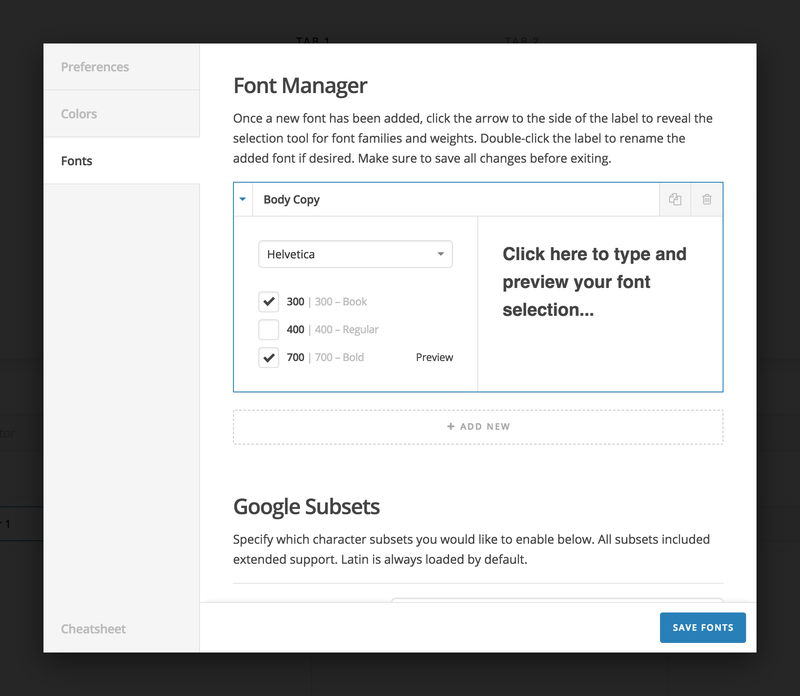 What is the purpose of the Font Manager? 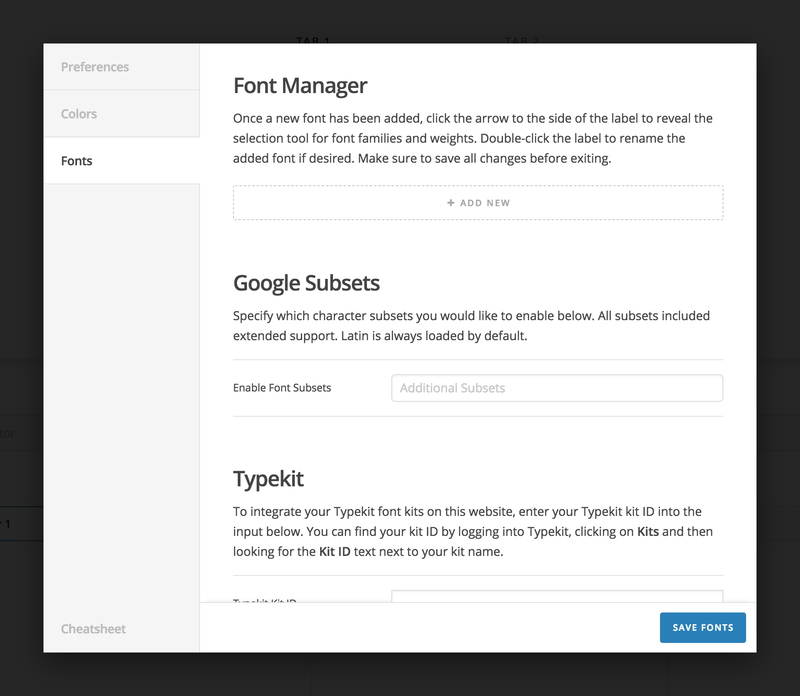 The Font Manager serves as an abstraction layer for easily assigning and updating fonts throughout the builders. For example, say you have some pages you've designed and they're using a couple very specific fonts. Maybe you have dozens or even hundreds of instances of these fonts across your site from paragraphs to headings to buttons and more. Now let's say that down the road you decide that one of those fonts used throughout those hundreds of instances needs to be updated. Without the Font Manager, you would need to revisit every element and update that font...one by one...hundreds of times over. 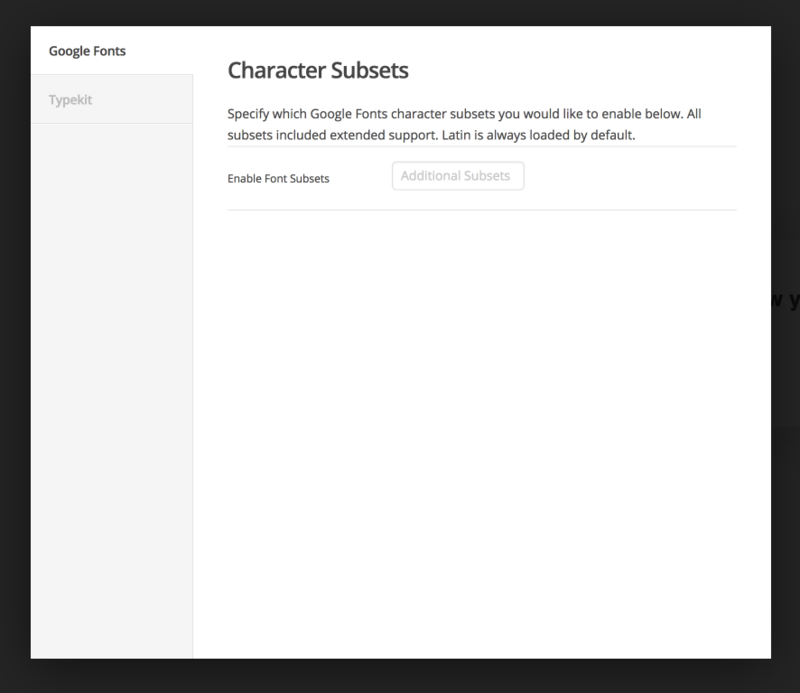 With the Font Manager, you can instead label a font however you see fit (e.g. "Body Copy") and assign that labeled font. 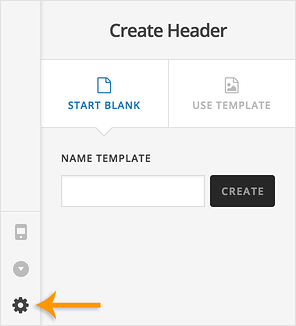 If you ever have to go back and update that font, you can simply update it once in the Font Manager and it will change all assignments of that font throughout your website. Can't change font in options! Is there a document explaining the handling of font size in the X theme? How do I change fonts for specific elements? How to change font of this header element? How to change post style! Is there a way to reset of all the theme settings back to defaults? Font Size And Featured Image On X Theme? 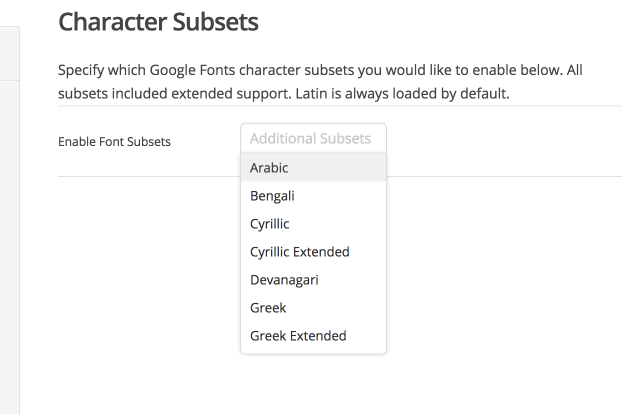 Benefit of using the font manager? Where is the font manager? 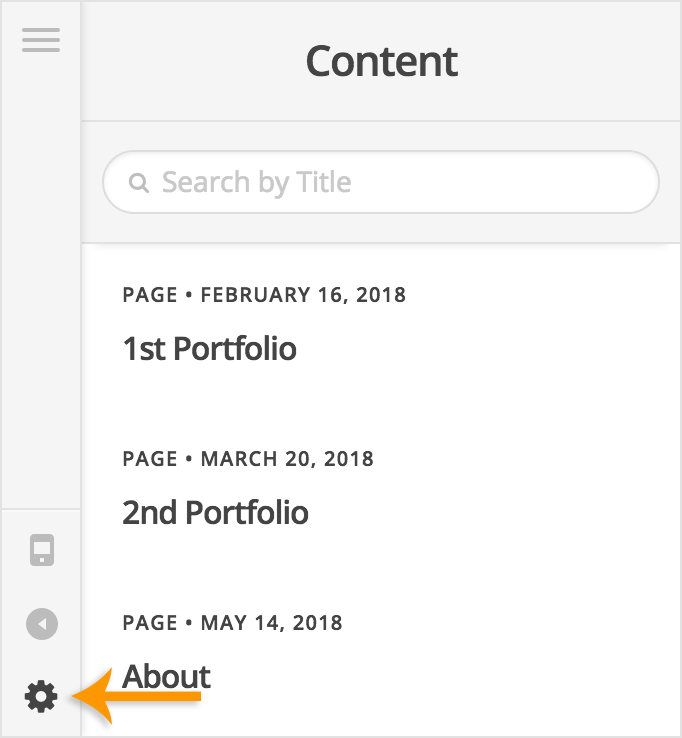 How to use Webfonts in Font Manager? I can't get the blog entry title to change font size! Where did my fonts go in new Cornerstone update? What is "Alternative Font" in Font Manager? And what's with the extra backup fonts in Index CSS? 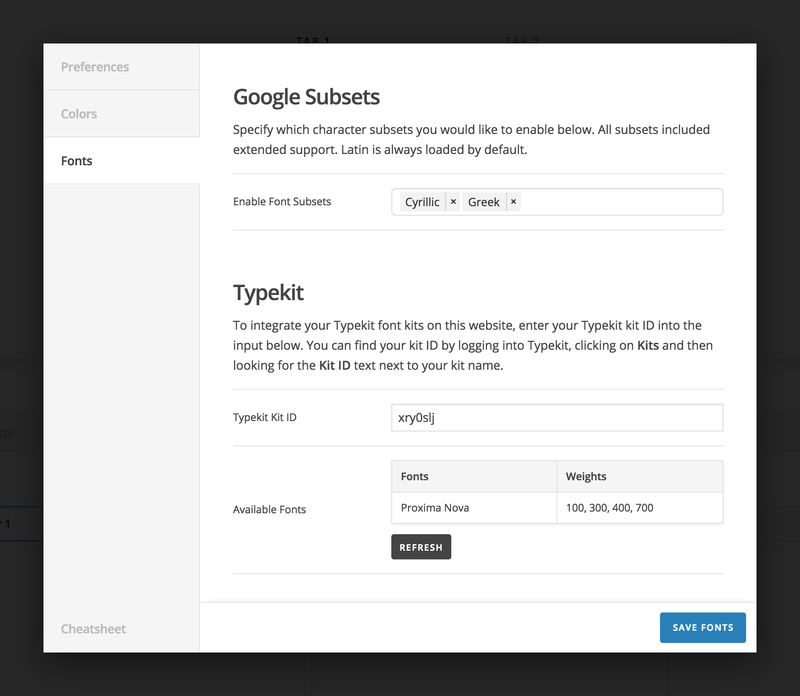 What is the difference between fonts, typekit and the font manager? 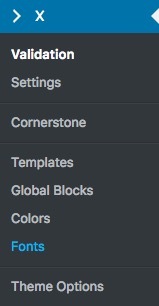 In "Pro" Typography under "Theme options" is not working with "new elements"
How Do I Change Font? Headers Corrupted and Need Rebuilding! Is it possible to have Mandarin text on a page? How to add custom font to my H4 tag? How can add system font to Font Manager?